Railpictures.ca - Stephen C. Host Photo: Peekaboo: A family marvels at the rare sight of a train along Crimea St in Guelph, 4777 plays peekaboo behind a house where the rails are mere feet to the cornerstone of the property. This track is the wye of the Guelph N Spur and has been like this for well over 70 years, the houses and factories dating to the 1940′s at least if not older. This was taken across the tracks and behind Kevin Flood’s shot taken a couple days earlier. | Railpictures.ca – Canadian Railway Photography – photographie ferroviaire Canadienne. 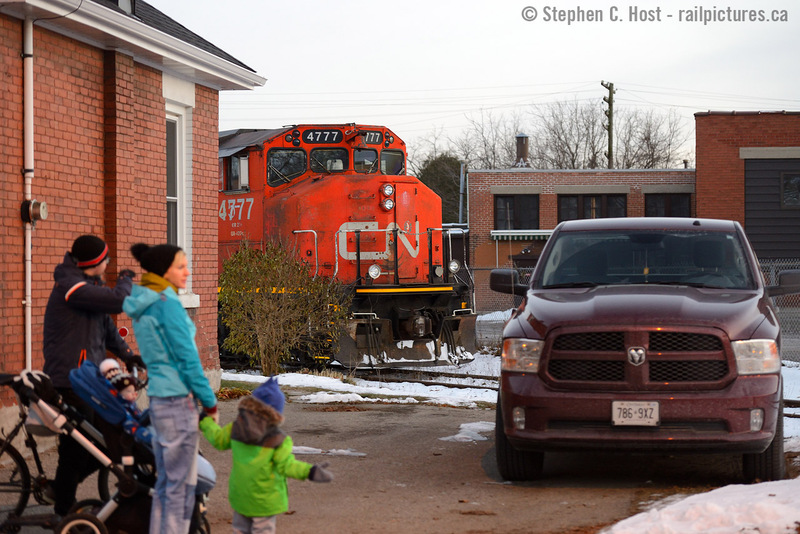 Caption: Peekaboo: A family marvels at the rare sight of a train along Crimea St in Guelph, 4777 plays peekaboo behind a house where the rails are mere feet to the cornerstone of the property. This track is the wye of the Guelph N Spur and has been like this for well over 70 years, the houses and factories dating to the 1940's at least if not older. This was taken across the tracks and behind Kevin Flood's shot taken a couple days earlier. Also one has to wonder the value of those homes there. Greater value to rail fans i’m sure…;) Like the old number shining through on the cab. Looks as though he’s about to pull into the driveway! Nice shot.